Your 1st grade students will be engaged all year long. 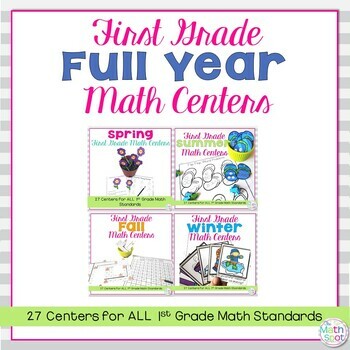 This bundle of seasonal math centers covers all first grade math standards (some standards have even more than one center!) Each season has 27 math centers and each season addresses all standards. These hands on activities will allow your students to solidify their understanding of first grade skills and strategies. With this bundle you save 20% off of the total value of the resources included. IT IS IMPORTANT TO NOTE THAT THIS BUNDLE IS NOT YET COMPLETE! As of right now, only spring and summer are included. The best part? You are only being charged for spring and summer! This means that when the fall centers are added on June 15, 2019 and the winter centers are added on August 10, 2019 you will receive these sets for NO additional charge! Every single math center includes a recording form so that you are able to introduce accountability into the centers. Great instruction is just the start of a students’ mastery of standards. First graders need time to practice and hone their new skills! 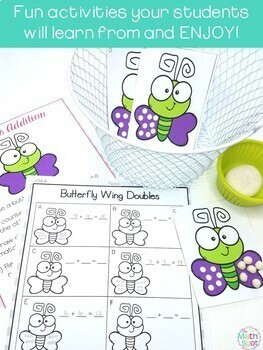 This set of SPRING themed math centers are designed to address all first grade standards. Is spring the time when all of these standards are traditionally taught? Of course not ! I have included all standards so that you have the opportunity for both review of previous concepts as well as differentiation for students who are ready to explore new ideas. Start with the table of contents, this is your road map to the skills practiced within each standard. For each math center you will find a student friendly instruction page, all center materials and a recording form. For no-fuss storage, consider storing the recording forms in numbered folders with the student instructions taped or glued just inside. Tuck these folders into a crate. For many of the centers, the materials are flat and will also fit into these folders. For centers with additional manipulatives, place numbered pencil boxes nearby with needed materials! A table of contents outlining which activity matches each standard or skill. 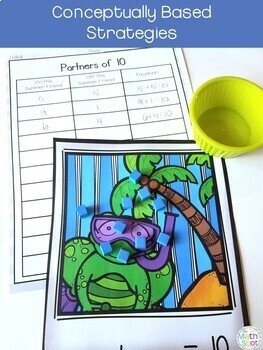 A printable page of instructions to store with each math center. **Print Friendly Tip** These can be printed 2 to a page, the text is large enough that they will still read will at 1/2 size. All hands on materials/cards you will need for each center. Occasionally, you will need to supply a very common math material such as linking cubes. A recording form for EVERY SINGLE MATH CENTER. 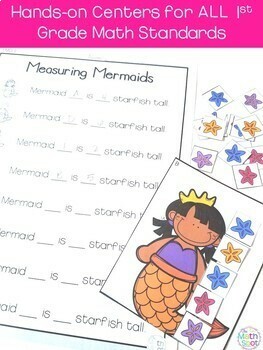 If you have students who like to get silly during center time, these recording forms will change the landscape of your math block! What do YOU do while your students are in centers? If you are remediating and working with any tier 2 or tier 3 students, check out these very detailed math intervention lessons as well!